Unleash the Fire Lance Pack on your enemies! Shogun, Trebuchet, Dervish, and Stalker Battlemechs - no assembly required. 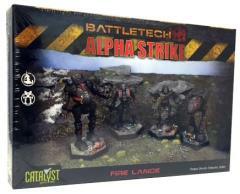 Perfect for BattleTech and Alpha Strike heavy metal action!